TOGETHER. FOR THE ENVIRONMENT. - Benvenuti su spongelbiosap! As well known by the insiders, the majority of the current natural-based SAPs comprise only absorbency in free-state conditions, while the water uptake under external pressure remains an acrylate-based SAPs prerogative. SPONGEL presents free swell capacity (FSC) values in saline solution between 37 and 45 g/g and absorption under load (AUL) values between 8 and 15 g/g. Minimal or no gel blocking occurs. Another important feature is the capacity to retain the absorbed liquid after centrifugation of the swollen SAP (centrifugation retention capacity – CRC). Surprisingly, SPONGEL reaches CRC values between 27 and 33 g/g, values similar to the best acrylic SAPs. 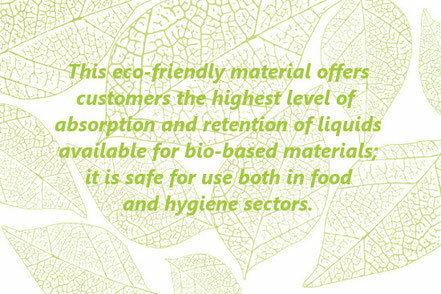 This eco-friendly material offers customers the highest level of absorption and retention of liquids available for bio-based materials; it is safe for use both in food and hygiene sectors. SPONGEL shows a gel-like appearance, similar to acrylic SAPs. No organic solvents have been employed not problematics linked to toxic monomers arise from SPONGEL production process. Treatment of waste materials, to collect and solidify domestic or industrial wastes, etc. 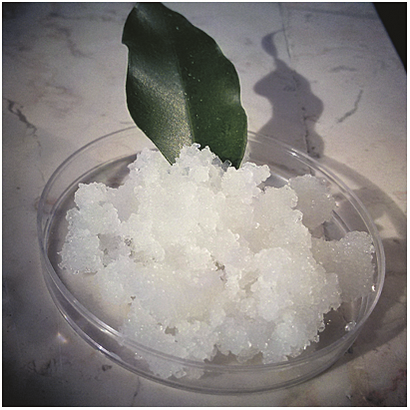 In a next future, additional specific characteristics will be also achieved, for example by covering the SPONGEL particles with natural antibacterial agents, in order to extend the shelf life of aliments or to obtain odour-control system.